Voici l'application officielle du site http://www.ragecomic.frdanslaquelle vous pourrez visionnez les derniers Rage Comics (Trollfaces) postés sur le site, avec son titre et sa date.Vous pourreznaviguer entre les différentes images postées et le partager surfacebook ou par mail etc.Plus de 7000 Rage Comics disponibles !Unefonction aléatoire vous permet d'afficher un Rage comic au hasardet un bouton permet de visionner ce rage comic sur le site, mettreun like ou poster un commentaire.Vous pouvez visionner les ragecomics publiés ou en modération en choisissant dans le menurespectivement "derniers" ou "modération".Utilisez les boutonsprécédent et suivant pour naviguer dans les comics / troll faces dusite !Les ragecomics (certains les appellent des troll faces) sontdes petites histoires comiques sous forme de bande dessinéesreprésentant des évènements de la vie quotidienne. Rage ComicFrancais Troll Face représente la plus grande base de données derage comics français !Il y a une fonction de marque page permettantde garder en mémoire la position actuelle pour y revenir plus tard(utile si vous voulez regarder tous les ragecomics, pour éviter dedevoir faire "suivant" pendant 3 heures quand vous relancez l'appliplus tard).NOTE : Pour mieux voir le rage comic, vous pouvez"pincer" pour zoomer.Pour info : Les permissions "voir l'état etl'identité du téléphone", "Lire le contenu de la mémoire destockage USB" et "Modifier ou supprimer le contenu de la mémoire destockage USB" ne sont actuellement plus utilisées dansl'application. Aucune info personnelle (numéro de téléphone,fichiers sur la SD/USB) ne sera utilisée.Here is the officialapplication site http://www.ragecomic.frwhere you can watch thelatest Rage Comics (Troll faces) posted on the site, with title anddate.You can navigate through the pictures posted and share it onfacebook or email etc.Over 7000 Rage Comics in stock!A randomfunction lets you view a Rage comic at random and a button to viewthis comic rage on the site, put a like or post a comment.You canview the published comics Rage or moderation by choosing therespective "last" menu or "moderation".Use the previous and nextbuttons to navigate through comics / troll faces the site!Theragecomics (some call them troll faces) are small comic stories ascomics depicting events of everyday life. Rage Comic French TrollFace is the largest base of rage Data French comics!There is abookmark function to keep the current position in memory to comeback later (useful if you want to watch all ragecomics, to avoidhaving to "next" for 3 hours when you restart the app later ).NOTE: To see more of the comic rage, you can "pinch" to zoom .FYI:The permissions "see the status and identity of the phone", "readthe contents of the USB storage" and "Change or delete the contentsof the USB storage" now no longer used in the application. Nopersonal info (phone number, files on the SD / USB) will be used. Voici l'application officielle du site http://www.loltube.fr etvous y retrouverez toutes les images drôles du site, avec son titreet sa date.Vous pourrez naviguer entre les différentes imagespostées et le partager sur facebook ou par mail etc.Plus de 7000Images Drôles sont disponibles !Une fonction aléatoire vous permetd'afficher une image au hasard et un bouton permet de visionnercette sur le site, mettre une note ou poster un commentaire.Here isthe official app of the site http://www.loltube.fr and you willfind all the funny pictures on the site, with its title and itsdate.You can navigate between images and posted share on facebookor email etc.Over 7000 Funny Images are available!A random functionallows you to display an image at random and a button to watch thison the site, put a note or post a comment. Communities are places where players on PlayStation Network withsimilar likes and interests can connect. Join Communities todiscuss topics of common interest with other members, find playersto play games with, and more. ・You can search for and joinCommunities. You can also create new ones. ・Check today's messagesand posts made by members on the Community wall. ・You can see partyand game session information related to your Community in [NowPlaying]. ・Receive the latest information about your Communitiesthrough push notifications. ・The Community owner and moderators canchange the Community image and background, edit the message of theday, and manage Community members. An account is required to usethis app. Use of this app is governed by the license agreement atthe following URL: (http://www.scei.co.jp/legal/index.html). [Ifyou have trouble signing in, or if you see a network connectionerror] • If you have both PlayStation Communities and PlayStationApp installed, change the settings on your device so thatPlayStation App does not automatically close in the background. Use PlayStation Messages to see who's online and to send messagesto your friends from your mobile device. Always stay connected withyour friends even while you're away from your PS4. The PlayStationMessages app for your mobile device includes the followingfeatures: • See who's online and what game they're playing. • Sendtext and voice messages as well as photos and stickers to yourfriends and groups. • Quickly access your groups by adding them toyour favorites. An account is required to use this app. Use of thisapp is governed by the license agreement at the following URL:(http://www.scei.co.jp/legal/index.html). If you like Indie Games and you love Humble Bundle, Humble Reminderis perfect for you! Would you like to be the first to purchase anew Bundle when it has been just published? Then you're going tolove this app! Choose which category you want to be reminded about(Game Bundles, Book Bundles or Mobile Bundles) and Humble Reminderwill notify you whenever a new Bundle from that category isreleased. Check the average price of your favorite Bundles! Use thedata plot of average prices to decide the best moment to purchaseyour Bundle! Humble Reminder is a tool designed to help HumbleBundle users to decide when is the best moment to beat the averageand get all those wonderful games. Humble Reminder also providesinformation about the content of the different Bundles in a fastand organized way. It allows you to configure a reminder for eachBundle, so you don't miss the opportunity to buy your favoriteBundle at the best price. Main features of Humble Reminder: • Checkthe content of all the different bundles from your mobile device(smartphone or tablet) • See the evolution of the average priceover time and decide when is the best time to purchase your desiredBundle • Configure a reminder for a Bundle and receive anotification when the average price goes below the price youspecified • Click the "link" button and go directly to the HumbleBundle web page to purchase your Bundle! Note: Humble Reminder isnot a Humble Bundle, Inc official app. However, Humble Reminder ispart of the Humble Bundle, Inc partner program. Enjoy the PRO version of Humble Reminder with all thefunctionalities! If you like Indie Games and you love HumbleBundle, Humble Reminder is perfect for you! Would you like to bethe first to purchase a new Bundle when it has been just published?Then you're going to love this app! Choose which category you wantto be reminded about (Game Bundles, Book Bundles or Mobile Bundles)and Humble Reminder will notify you whenever a new Bundle from thatcategory is released. Check the average price of your favoriteBundles! Use the data plot of average prices to decide the bestmoment to purchase your Bundle! Humble Reminder is a tool designedto help Humble Bundle users to decide when is the best moment tobeat the average and get all those wonderful games. Humble Reminderalso provides information about the content of the differentBundles in a fast and organized way. It allows you to configure areminder for each Bundle, so you don't miss the opportunity to buyyour favorite Bundle at the best price. Main features of HumbleReminder: • Check the content of all the different bundles fromyour mobile device (smartphone or tablet) • See the evolution ofthe average price over time and decide when is the best time topurchase your desired Bundle • Configure a reminder for a Bundleand receive a notification when the average price goes below theprice you specified • Click the "link" button and go directly tothe Humble Bundle web page to purchase your Bundle! 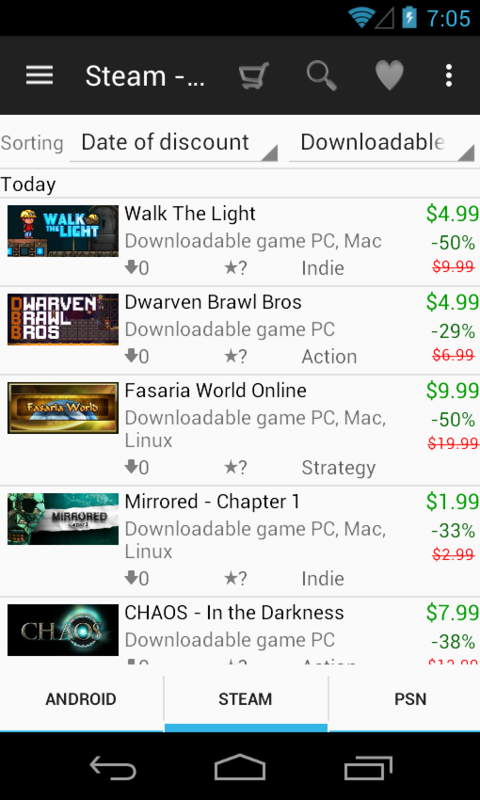 Note: HumbleReminder is not a Humble Bundle, Inc official app. However, HumbleReminder is part of the Humble Bundle, Inc partner program. Manage your Warid connection with the swipe of a finger! Subscribeto services, bundles, packages and get all account details andupdates through My Warid app.You can use it to do the following:Self-Care Section:• Recharge your account• Manage FnF numbers • Getaccount details • Balance infoPackages & Services Section: •Change your Package• Subscribe/Unsubscribe to Internet & SMSBundles & LBC Offers• Subscribe/Unsubscribe VAS Services Thekey features include:• Activate/deactivate prepaid and postpaidbundles and value added services• Self-care services (billing info,usage reports, package change)Convenience for Warid CustomersTheconcept of providing a mobile app to manage your Warid accountbrings great convenience to Warid Customers. The app makesfollowing processes very easy for the customers to perform:• Quickview of their currently acquired suite of VAS services•Activate/deactivate and/or subscribe to value added serviceswithout having to remember the numerous short codes and keywords. •View usage summaries, balance inquiries, minutes left, Bundlequota, GPRS usage all from the user friendly icon based userinterface. Again, no calling to customer services or rememberingcodes/keywords required. Just tap and get it done, it’s thatsimple.• Stay updated about the latest offers from Warid. You willnot need to look these up on your own; instead, these willautomatically get to know via this appApart from having theconvenience to perform all of the above operations, Warid mobileapp would also make it possible for you to share exciting offersthat you subscribe to with your friends and family in your socialnetwork Terms & Conditions1. My Warid is available free of costat the App stores2. App browsing and downloading will be charged asper your Internet package plan3. Services Activation / Deactivationwill be charged at their respective rates, there will be noadditional charges to activate/deactivate these services via MyWarid.